A rich and colourful sliding wardrobe with a lovely gloss finish. This white sliding wardrobe provides a perfect clean bedroom finish. The white glass mirrored sliding doors make a modern statement. Sliding wardrobes with white glass & mirrors to enhance natural light. Make a bold bedroom statement with black edges and mirrored doors. An unusual wardrobe colour combination that works well together. An eye-catching blend of red and black glass sliding wardrobe doors. The nocino grain really accentuates the width of these wardrobe doors. Dark and rich natural colours combine on these sliding wardrobes. Relax with these cool and elegant sliding wardrobe doors. This pink & white wardrobe can really finish off your dream bedroom. A simple and effective black and white finish on these wardrobes. This arch shape mirrored design provides a classic contemporary feel. A stunning and intoxicating combination of black and grained walnut. 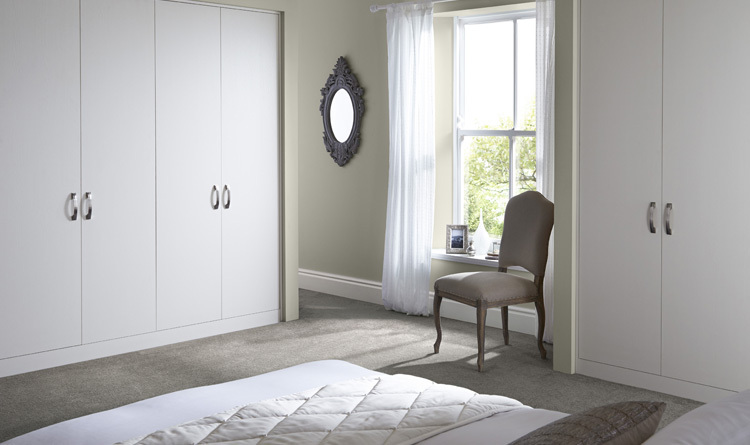 A frosted white glass sliding wardrobe finishes any bedroom perfectly. Our spectacular sliding wardrobes provide a fantastic storage solution that makes the most out of any given space. Whatever your tastes, our wide range of sliding wardrobe designs mean we're sure to have something that appeals to you. For fitted sliding wardrobes with bags of both style and substance, look no further than Betta Living. We offer a range of sliding wardrobes in a variety colours and designs, created to suit your taste and budget. Not only will your made-to-measure wardrobe suit your bedroom and personality, it will be built from the best materials available at Betta Living’s British-based factory. As fitted furniture specialists, you can trust our teams to keep disruption to a minimum. Interested in a fitted sliding wardrobe? Simply request your free brochure to browse our full range or arrange a design consultation.